Listening to vinyl is one of our favorite past times, and nothing beats that initial snap and crackle of a record once that needle hits the surface. But in order to embrace this, we need a particular pair of speakers to fully optimize our listening experience. 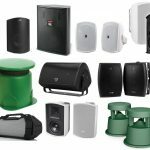 We personally value our vinyl station and will probably be collecting records forever, so with our expertise in speakers we wanted to provide you all with some of our favorite picks as the best speakers for listening to vinyl records. We’ll give you about 10 of them to give you some options based on few of our recommended factors below. 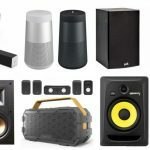 Budget – How much money isn’t necessarily the deciding factor here, but really how much you want to spend on speakers for your turntable. Some just need speakers to leisurely listen to music that will provide at least some decent quality, while others want the biggest, most powerful and flattest sound they can attain. We’ll find different price-points for you accordingly. 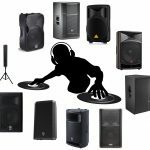 Type of speakers – Only a chosen few of speaker types will be able to work with turntables with their TRS or XLR ins, since many computer speakers are typically USB or perhaps old school 3.5mm. Even if some other types are compatible, we recommend two of the following, and this is because these types of speakers typically present us a flat response — meaning, they distribute frequencies evenly without jumbled low or high-ends that many cheaper, made-for-after market consumers typically do. 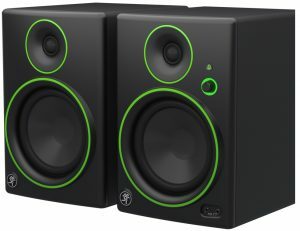 Studio monitor speakers – Always recommended for those in a home studio, in particular for mixing music since they’re dedicated to one thing — accuracy. For vinyl, it’s just our personal preference, but we want exactly what the artist intended for us to hear. We have many of these recommended below. 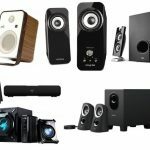 Bookshelf speakers – Another viable option for an accurate and clear sound, bookshelf speakers are typically included in a home audio system and are the backbone of the sound distribution. Many people love these for vinyl since they not only look great, but sound amazing and can also fit nicely in a vinyl station. Need more bass? Buy an external subwoofer. In our opinion, studio monitors and bookshelf speakers will come with feasible bass, but by no means will rattle the room or house with bass as some may prefer. This will of course increase your budget, but may be a wise investment for those who really need it. Need more power? 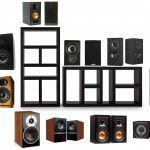 Look specifically for wattage and how much total RMS a pair of speakers can provide (although every single pair we’ve picked in here can at the very least power an entire room for your vinyl). Speaker specifications can become pretty jargon-filled, so we’ll do our best to describe what’s most important. Here’s one of favorite picks as the best speakers for listening to vinyl, and we’ll start this off with a very affordable pair of studio monitors by one of our favorite speaker brands in the game. The CR3 are very highly rated among users around the net since these have been out for a few years now, so we’ll have confidence in our buy seeing those thousands of stars. They have a decent sized 3″ driver built-in, nice frequency range of 80 Hz to 20 kHz to cover the whole spectrum of your record’s sounds, and a decent power handling of up to 50 Watts. It’s not going to rattle your walls or windows or anything, so if power was indeed a big concern of yours, we’d go with a different pair. Otherwise, for most rooms and homes, these will be quite loud enough. A few other additive features we like about the CR3 is their easy volume adjustment knob on the front, numerous in\out options on the back, as well as Bluetooth connectivity in case you want to hook up your phone to play some tunes when your turntable is taking a break (or perhaps your turntable has BT, some do nowadays). 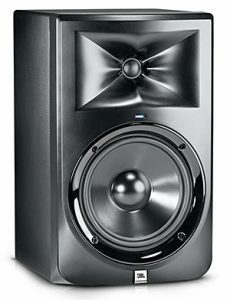 All in all these will pose as a great pair of speakers for really any type of use, but especially for listening to vinyl, you’re getting an accurate ‘monitoring’ distribution of frequencies with the Mackie CR3 for great sound quality of your records and a decent amount of power at the same time. Very cost-effective as well and an overall safe pick as number one here. You may want something higher in quality so continue reading, otherwise you’re fine stopping here. Let’s get into a higher-end pair of bookshelf speakers here with the Studio 230, and for vinyl listening these have been recommended by quite a few sites we’ve seen over the internet for good reason. 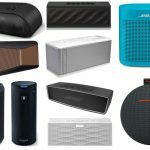 JBL is an obvious brand many know well, but what about the quality of these things? And why are they good speakers for listening to vinyl? 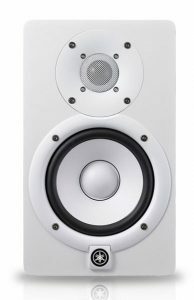 If your budget allows, they have a very large 6.5″ driver with a noticeable mid-range accuracy that’s a bit more rare in bookshelf speakers cheaper than this one. Typically a subwoofer and tweeter are prominent in the sound but the technical mid-range is where less expensive speakers start to lack. This is what drives the price up for these so if you’re one to be concerned about detail, here’s a good one to grab. There are some other more ‘advanced’ technology in these that sets them a part from other vinyl speakers, especially with their HDI waveguide that in a nut shell, helps preserve the sound waves after they leave the speaker to prevent disbursement all around the room. Instead it creates a ‘natural balance’ and ‘full spectrum’ type of sound and feel. Many consider this ‘cinematic’ and others just think it’s fancy tech to drive up the price in a highly marketed brand. But for those listening to vinyl records and want speakers that pertain to higher-end budgets with an emphasis on detail, especially in regards to room acoustics, the JBL Studio 230 are definitely super nice. As we listen to some tunes while typing up this guide right now, we’re using a pair of our Rokit’s and can’t see us doing so different for a long time. 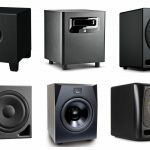 These are some of the most solid studio monitor speakers in the game, and the entire Rokit series is worth checking out. 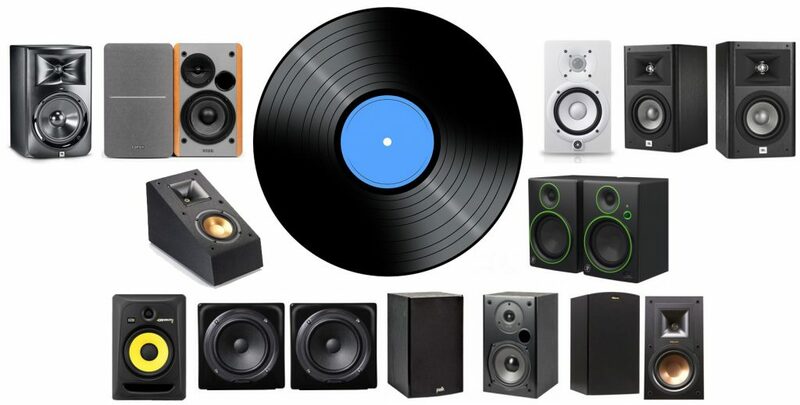 We recommend grabbing a pair based on your budget, since the higher you go in their series the larger specs and more power you’ll be attaining for your vinyl. As studio monitors bringing ‘accurate’ sound quality intended for musicians who mix and master, getting that clear sound for records is also pertinent for us. This particular pair isn’t recommended for any sole reason aside from being their most popular due to their affordability, so again we recommend going as high as you can if your wallet allows. The 8 G3 brings us 8″ woofers, 1″ tweeters, a 35 Hz to 35 kHz frequency response, and great power in their bi-amped class A/B amplifier giving us a whopping 100 watts of power. The build is also great in regards to longevity and will last you years. 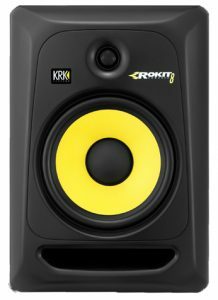 The KRK Rokit 8 G3 are by far high-end and one of our favorite picks as the best speakers for vinyl. These are a beautiful pair of vinyl speakers that come slightly smaller than the typical studio monitor or bookshelf speaker, but in actuality is why we like them — great for vinyl stations at a home, room or studio to keep it compact, clean and sleek. Don’t let the size fool you, however — they still offer some superb specs for listening to your records. A decent 90Hz – 17,000Hz frequency range (we’d recommend an external subwoofer if you’re really concerned with bass, since most music can go all the way down to 20 Hz), Class A/B amplifier with 60 watts of power, and 5.25″ driver. Available in quite a few colors, you can also add to your personality or perhaps current set up to keep it aesthetic. Keeping them on stands or at ear level somehow with a desk will be preferred, and there’s also a little gain switch you can use to adjust your levels accordingly. A great solution here with the Avantone MixCubes if the size is attractive to your current vinyl setup and workstation — they’re definitely not cheap, however. We’d recommend Klipsch’s entire “Reference Family” if we could, but we’ll stick with this pair of bookshelf speakers that are within the middle price-point and bring beautiful audio quality to your vinyl station. Coming in as a pair, these speakers bring 5.25″ copper woofers for a nice bass response and 1″ tweeters for great highs, and a rear firing port to aid in the decreasing of build-up that sometimes happens in the back of bookshelf speakers, especially if they’re close to walls. These are great for small to medium walls and we’d consider them higher-end bookshelf speakers for those who were in need of this option for their vinyl record listening. There’s lastly tech included called “Liner Travel Suspension” which is their type of tweeter that’s meant to minimize distortion and increase detail in the higher frequencies, something many speakers aren’t able to do (especially with this type and price-point). 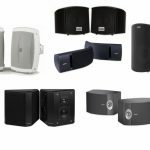 The Klipsch R-15M are a viable pick as the best vinyl speakers if your budget allows and these fancy features pique your interest. Here’s one of our favorite budget-friendly bookshelf speakers for vinyl, and we’ll take a different direction here in regards to budget — this is strictly for those who don’t want to spend hundreds on their pair. 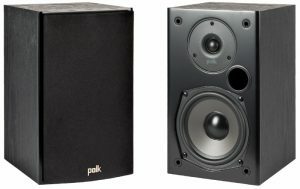 Polk Audio is a reputable brand first and foremost, and this pair typically hits under one hundred bucks. You’re still getting some decent quality here, and more than enough power and frequency distribution for simply enjoying some records at home. They have dynamic balance drivers, magnetic shielded enclosures, and a keyhole slot for wall mounting. The front mounted bass port is standard for speakers we love, and this typically aids in the distribution to prevent build (those without it don’t have as much release for the lower-end). Although they’re cheap and you’re sacrificing the lack of some advanced technology built-in to these or whopping internal components, you’ve got decent specs here — a 45 Hz to 24 kHz frequency response, 5.25″ woofer, .75″ tweeter, and about 20 watts of power for each speaker (40 total). Not too bad with the Polk Audio T15, and a great option for vinyl speakers if you’re just in need of some decent speakers to listen to some tunes casually. First keep in mind these are sold separately, to not only remind you to buy two but also understand that they can add up. Now that we have that out-of-the-way, here’s one of the best speakers of all time, especially when it comes to needing a clear frequency distribution, in particular a super rich low-end and great focus on the mid-range. Aside from the beatiful sound, let’s look into some of the advanced tech in this one as well (which also adds to audio quality, of course). There’s an “Imagine Control Waveguide” that controls the vertical and horizontal planes of the sound waves after they’re dispersed from the speakers to keep them directed at listening position, a “Slim Stream” low-frequency port design for a very deep bass sound, as well as LF and HF Trim “TRIM” switches for allowing you to tweak some of the sound based on your own room acoustics and personal preferences. The JBL LSR308 are an obvious luxurious and high-end pick as the best vinyl speakers, but if you’re into that, here’s your recommendation. 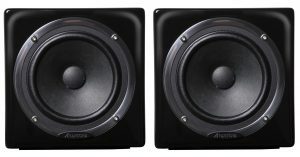 Another heavy hitter in the studio monitor department, if you can grab these for listening to vinyl, you’ll also have a viable pair of monitors for just about any usage in regards to superb sound quality. We’ve seen these used for the obvious home studio choices, but also leisure listening on the computer, gaming, and more. 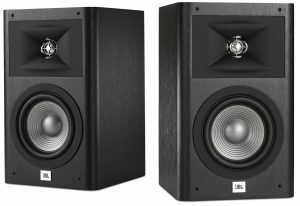 We recommend these instead of the previous JBL monitors if you still wanted a higher-end speaker but for a bit cheaper in price. The HS5 are also sold as a single speaker, so keep that in mind if you need a pair. They’re well-known for their flat response and excellent distribution of frequencies, in particular mid-range. You have a 2-way bass-reflex bi-amplified build with a 2″ woofer (cone) and 1″ tweeter (dome), very wide 54Hz – 30kHz frequency response, a ‘room control’ and ‘high trim’ response control, as well as TRS and XLR phone ins for balanced or unbalanced signals into your vinyl turntable. Just an overall solid pick as the best speakers for vinyl listening with the Yamaha HS5. You can’t go wrong with any speakers from their HS series. Let’s visit yet another budget-friendly speaker for vinyl listening on your turntables. A bit less of a known brand here but the reviews back up the effectiveness of these. They hook up via their dual RCA inputs if you have multiple tables, and you can also control the volume adjustment and mute via a remote control. The nice wooden finish will look great in a more vintage-style vinyl setup or station. So how about the specs? Not the largest, biggest or baddest, but a feasible amount of quality is fine here. 13mm silk dome tweeter and a 4″ woofer. A huge plus for us is also the included knobs on the side that allow you to adjust both the treble and the bass (from -6 to +6 db). Nothing too crazy in regards to power or performance, but for a price at this, you’ll be saving money and also attaining a reliable speaker for your vinyl that also gives you a nice look in your vinyl station. Look into the Edifier R1280T if none of our picks have propped up your ears yet. Lastly, here’s a good pick as the best speakers for vinyl with a unique design and sound to them. 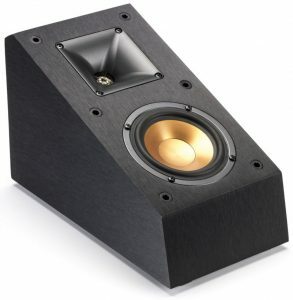 With the signature Klipsch black and gold shell, these are a part of their previously mentioned ‘Reference Family’ and is considered an ‘elevation speaker’ which are typically used in home theaters, but we love the size and sound these provide and can be a nice little fit into your vinyl area you have at home. 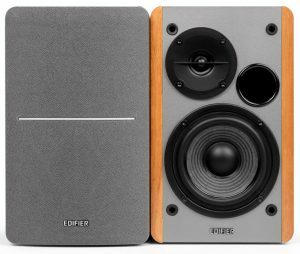 With nice tech included in the Dolby Atmos, these are obviously a lot tinier than bookshelf speakers but add the same type of surround-sound (they’re at 7.25” x 6” x 11.25″ dimensions). We have 3/4″ linear tweeters made of aluminum and 4″ copper woofers for a pretty impressive internal build despite the size. Yes, some consider these ‘surround sound’ speakers but can still work with vinyl in our opinion. 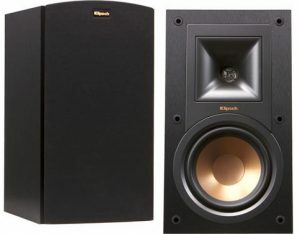 If you want a different pick as opposed to all of our studio monitors and bookshelf speakers and need something snug for your turntable, check out the Klipsch R-14SA.